Illustrations note XV, 914 p. In 2 volumes, not available separately. 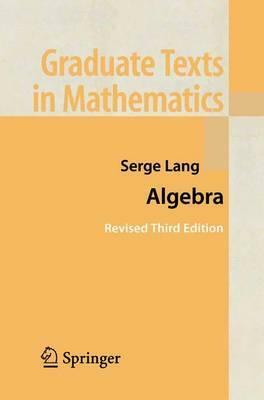 Lang's Algebra changed the way graduate algebra is taught, retaining classical topics but introducing language and ways of thinking from category theory and homological algebra. It has affected all subsequent graduate-level algebra books. April 1999 Notices of the AMS, announcing that the author was awarded the Leroy P. Steele Prize for Mathematical Exposition for his many mathematics books. The author has an impressive knack for presenting the important and interesting ideas of algebra in just the "right" way, and he never gets bogged down in the dry formalism which pervades some parts of algebra.